Appearance: White background with distinctive veining that can range from gold to silver and grey. Properties: This material has low abrasion resistance (1-3 on the Mohs scale): light scratching will occur with exposure to sand and other abrasives. The finish will patina or dull over time as a result of this scratching. Statuario has a low to moderate absorption rate: always seal this material prior to use. Finally, it is moderately sensitive to acids: the finish will patina over time. Statuario is not approved for use in exterior applications. 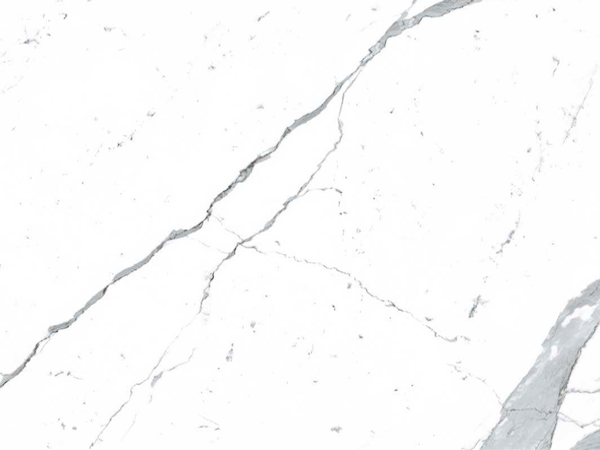 Use: Due to its good wear resistance, Statuario is suitable for all internal uses, including flooring, wall covering and bespoke stonework – such as vanities, shower trays, etc. – in both domestic housing and in buildings with moderate commercial use. The stone material and the stone finish should be selected to suit the area it is being applied to. As most white marble, Statuario is not recommended to be used for kitchen worktops or surfaces for food and drinks preparation: acidic liquids (such as lemon juice, vinegar, etc.) will etch the surface. Formats: Tiles, slabs and cut-to-size stonework. Finishes: Polished and honed. Other bespoke finishes are also available upon request.